In recent days, Ukraine’s security services detained the several-time Azerbaijani wrestling champion of Europe, who is wanted on charges of participating in a foiled Caucasus Emirate (CE) plot to carry out a series of attacks in Baku, Azerbaijan in 2012. This was not just a CE mujahedin plot but that it also involved Al Qa`ida (AQ). Valekh Amiraliev is said to have participated in a 2011 meeting to plan the attack with several members of the group organized by its leader, Vugar Padarov, who also attended the meeting. He was detained at the airport in Ukraine’s city of Borispol. A year later, in 2012, the Azeri security forces uncovered the joint CE-DV-AJ-AQ multi-pronged, Mumbai-style plot to attack several targets in Baku, assassinate President Ilham Aliev, and begin a countrywide insurgency. Could Amiraliev’s presence in Borispol represent an effort by one jihadi group or another to infiltrate Ukraine and through its borders to Russia or Europe? The Azerbaijan plot appears to have originated among the top amirs of the CE’s then very powerful network, the Dagestan Vilaiyat (DV), in Russia’s republic of Dagestan, which formed an ‘Azerbaijani Jamaat’ no later than July 2010, about which I had been warned at the time and in ssubsequent months and years. The CE’s DV had been surging domestically and internationally evidenced by attacks like the March 2010 double suicide bombing of the Moscow subway (carried out by the respective wives of amirs Daudov and his notorious successor as DV amir “Seifullah Gubdenskii’ Magomedali Vagabov) and the DV Czech cell uncovered in April 2011. On 30 May 2012 Azerbaijani authorities announced a series of special counterterrorist operations rooting out an alleged CE/DV-tied group of global jihadists – “a transnational armed criminal group” – planning a series of attacks in Azerbaijan’s capitol of Baku during the entertainment awards competition ‘Eurovision-2012’ as well as later attacks to be carried out across the city and the country. Azerbaijan’s security forces were able to uncover the plot as a result of information gathered from a series of previous arrests of DV-tied mujahedin in Gyanja, Azerbaijan in April. They were part of a plot also connected to this group to assassinate Azerbaijan President Ilham Aliev and carry out other attacks. The Eurovision plot was apparently to be the centerpiece of this series of attacks to be carried out both before and during the Eurovision contest, reminiscent of the 2008 Mumbai attacks involving a coordinated series of operations. The plot envisioned attacks bombing and ambushing gathering places in the Baku Hilton and JW Marriott Absheron hotels, the Crystal Hall (where Eurovision was held), and State Flag Square, all located in downtown Baku. There has been no mention of plans to take hostages as in Mumbai. There were, however, plans to carry out operations in a number of regions of Azerbaijan, including bombing places of pilgrimage and mosques, killing law enforcement personnel, and ambushing administrative buildings with the goal of seizing weapons and ammunition. According to law enforcement officials, security operations occurred in the Baku, Gyanja, Zakatal, Shekin, Gusar, Absheron, Khachmaz, and Shabron regions. According to the National Security Ministry (NSM) and later CE reports, the CE’s plans for extending jihad to Azerbaijan were hatched in February 2011 at a shura of the DV, now spearheading the CE’s jihad in Russia. The shura of DV amirs was convened by DV amir ‘Salikh’ Ibragimkhalil Daudov. It took place, according to the NSM, not far from the village of Kadar, which is located in southern Dagestan, with the participation of three Azerbaijanis: Vugar Padarov, Elmir Nuraliev, and Samir Sanyiev. Daudov appointed Padarov as amir of the group with the nom de guerre of ‘Bursa Zakatalinskii’ (from Zakatal, Azerbaijan) and provided “a large quantity of funding” for the prospective Azerbaijani operations. In December 2010, the DV’s AJ amir actually was identified by the nom d’guerre ‘Abdullah’. Nevertheless, the NSM’s account was later confirmed by CE-tied sources. According to other NSM sources, the plot had even wider global jihadi provenance than just CE involvement. Nuraliev, operating under the jihadi name ‘Maga,’ met Padarov in 2010, arrived in Dagestan in 2010 after having participated in DV operations in Dagestan under both Velidzhanov and Daudov. Padarov formed the group in summer 2011, and at some unidentified time members of the group underwent “special preparation” in a madrasah in Syria. Then some of those members went to Waziristan, Pakistan and trained with AQ-tied ‘Islamic Jihad.’ If ‘Islamic Jihad’ means the Islamic Jihadi Union (IJU), then this would be consistent with the growing ties between the CE and IJU. After training the Azerbaijan Jamaat’s members in Waziristan, they went on to participate in operations in Afghanistan’s provinces of Paktiya, Host, Kandahar, and Helmand. Other members of the jamaat underwent a two-month training course in Iran. The plot’s possible connections to the IJU, Pakistan, and Iran highlight the nature of the global jihadi revolutionary movement and the CE’s growing role within it. Padarov, Nuraliev, and Sanyiev reportedly entered Azerbaijan in July 2011, and, according to the NSM, were met in northern Gusar District in northern Azerbaijan by one Amir Muradov and driven to Sumgait. Sanyiev went from there to Baku, while the other three headed to Zagatala. Padarov, at the head of an armed group, was supposed to lead the assassination of President Aliev during his visit to the country’s northwest and organize armed attacks on administrative buildings and a number of explosions. Nuraliev and Padarov also were supposed to gather intelligence, determine the location of a number of state organization’s offices, their officials’ schedules, the number of personnel, and the best positioning for snipers. After carrying out attacks on Baku’s hotels, the Crystal Palace, and Flag Square, the group was to withdraw to the forested mountains of northern Azerbaijan, bordering Dagestan, and conduct further operations in conjunction with additional forces coming from Dagestan. Azeri security discovered weapons caches and other supplies hidden away in the forested mountain regions in northern Azerbaijan along the border with Dagestan. Sanyiev was appointed by Padarov as the amir of another subgroup of mujahedin and took the jihadi name of Abu Ubeid. He purchased a large quantity of explosive materials and a Nissan Pathfinder, and other members of the group, including one Timur Guseinov, conducted surveillance of personnel to be attacked. Several car bombs were to be prepared with the Nissan and the automobiles of other members of Sanyiev’s group. These vehicle-born IEDs were to be deployed on Baku’s central square and in the abovementioned hotels’ parking garages. Guseinov was to purchase a ticket for the Eurovision contest’s final evening and detonate an IED or “shock bomb” there. The jihadists’ hope was to induce a mass panic and rampage crushing the events’ attendees. The car bombs deployed in front of the hotels and another close to Flag Square were to be detonated simultaneously. In total, Azerbaijani security forces’ special operations detained 40 alleged AJ members. In some cases law enforcement met with resistance, and one of the leaders of the group, Vugar Padarov, was killed as a result. Guseinov resisted arrest, fired on security forces and police, and was killed on May 16th. Sanyiev initially managed to escape but was captured as he was preparing to leave the country in Gazakh (Qazakh) District near the borders with Georgia and Armenia. A similar sequence of events occurred with a member of the group identified in another press report as Samir Piriev. Two NSM personnel were wounded during the arrest operations, according to the same report. Azeri security uncovered 13 automatic rifles, one machine gun, 12 pistols, 3 carbines, 3,424 bullets of various caliber, 23 hand grenades, 26 F-1 grenades, 3 RG-42 grenades, various readied explosive devices, 2,352 grams of plastic explosives, two containers containing 20 kilograms of explosives, 675 grams of TNT caps, 19 detonators, 19 electrical detonators, other ammunition and weapons, 48 walkie-talkies, and “literature of an extremist character.” One IED was prepared which used a toy car remote control as a detonator and in which 438.2 grams of plastic explosives and metal strands were placed. This particular IED would have killed everyone within a 100-meter radius, according to Azeri law enforcement. NSM claims of possible Iranian involvement in the plot while possible seem unlikely. It cannot be excluded entirely that the DV’s predominantly Sunni mujahedin could include or utilize Shiites from Dagestan in cahoots with Iran. Azerbaijan is domnated by Shiite Muslims. The largest ethnic group straddling the Azerbaijani-Dagestani border, the Lezgins, are Sunni of the Shafi’i rite, but small numbers of Lezgins living near or inside Azerbaijan are Shiite. Iranian-CE cooperation and experience in Azerbaijan, beyond benefits for Iran’s efforts to expand its influence in the north, could have the added value of creating a mechanism by which Teheran could pressure Russia not to abandon its protection and support of Iran’s nuclear ambitions. CE websites immediately seemed to confirm CE ties to the plot. The CE-tied website ‘Umma News’ referred to Padarov as “our brother” when he was killed in the April counter-terrorist operation in Gyanja. Padarov was also said by Umma news to have “received that which he had wished for (Allah, please accept him and lead him to Jannat)” and decribed as follows: “Vugar Padarov became the first person on Azerbaijan’s territory, who has committed istishkhad (martyrdom usually associated with suicide bombings) in his homeland. Azerbaijani mujahedin have shown themselves to be good and gallant soldiers for us in the Caucasus. But up until now there no news had come about similar actions of Azerbaijan’s territory. This (first such news) testifies to the attainment of a certain level of understanding and faith by the jamaat of monotheists.” Umma News expressed optimism given that the arrests of the Azerbaijan Jamaat’s members occurred over a broad swathe of Azerbaijani territory, which it argued testified to the expanding geography of the global jihadi revolutionary alliance’s support in that country. It also issued an overt threat: “No Mossad, MI-6, CIA, NSM or any other tree-lettered organization can defend from the punishment that is being laid down for them. Their blood is the water which will wash a part of the sins of the monotheists, which they earn for each second of a peaceful life under the whip of the non-believer. Blood of this European scum absolutely will be spilled. The past operation, which became famous to the entire world, is an advertisement about the potential of the gallant Muslims of Azerbaijan. There will not be explosive materials and tubes, there will be chemical weapons and knives.” Videos issued later showed clips of the shura at which the DV amirs sent ‘Busra’ Padarov off to Azerbaijan to begin organizing operations. It should have been expected that jihadi groups would attempt to take advantage of the weakening of the Ukrainian state and the increasing chaos in the country and across its borders with Russia and potentially Hungary and elsewhere and infiltrate mujahedin into Ukraine and through farther afield. This is made more likely by both sides in the Ukrainian civil war to use Chechen and other North Caucasian mercenaries. Recall the dispatch of a unit of Chechen fighters to the Donbass apparently ordered by Chechnya President Ramzan Kadyrov widely reported in the West. In addition, the many CE-tied, Chechen-led and/or Caucasus-populated groups and amirs fighting in Syria and Iraq have an interest in extending operations or at least lines of communication into Ukraine. For example, one of the amirs attending the DV shura that sent Padarov off to Azerbaijan and thus involved in planning the Azerbaijan Jamaat operation was, was the DV’s Southern Sector amir ‘Abu Mukhammad’ Rustam Asildarov, who was also at that time one of the DV amir’s naibs. In 2010 Asildarov became the DV’s amir and in early 2015 he defected along with the majority of the CE’s amirs and mujahedin to the Islamic State or IS (ISIS/ISIL, Daesh)but remained based in the Dagestan. Asiladarov is likely the amir of the new ‘Caucasus Vilaiyat of the Islamic State’ (CVIS). This means he is subordinated to the infamous and influential IS Northern Front amir and former CE operative Tarkhan Batirashvili. 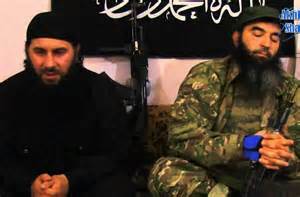 Moreover, it has been reported that Batirashvili’s brother XXXXXX is the money bag or financial officer for IS. Batirashvili has expressed his intent in the past to return to the Caucasus and made other statements indicating his continued interest in jihad in the Caucasus, and he now has a resource of several hundred mujahedin in the CVIS at his disposal for doing so. Therefore, it cannot be excluded that IS is interested in establishing Ukrainian lines of communication. The Caucasus Emirate in Sham (Levant) or CES, has a potential interest in setting up shop in Ukraine’s (former) region of Crimea. Abdulkarim Krymskii, about whom I have written about quite about on this site, is from Crimea and is the deputy or ‘naib‘ of the CES’s amir Salahuddin al-Shishani, who was originally the CE’s special envoy to Syria’s mujahedin. Shishani has retained his loyalty oath to the CE ‘s most recent amir, ‘Abu Usman al-Gimraviii (born Magomed Suleimanov), who was killed in summer. Until spring, Shishani and Krymskii were the amir and naib, respectively, of the more than one thousand-strong jihadi group of foreigners fighting in Syria, the Jeish al-Muhajirin wal-Ansar (the Army of Emigres and Helpers) or JMA. However, dissension and conflict led to their expulsion from the JMA, and they were reportedly followed by several tens of mostly North Caucasus mujahedin. The JMA and the now independent CES are close to Jabhat al-Nusra (JN). All three have taken AQ’s side in its struggle for the leadership of the global jihadi revolutionary movement. Could the CES, CE, JN, and/or AQ be trying to infiltrate Ukraine? Another possibly related issue in terms of jihadi networking in and around the Ukraine crisis is the presence of a unit of Chechen and perhaps other North Caucasians fighting on the side of Maidan Ukraine’s forces in the increasingly ‘frozen conflict’. Perhaps also relevant are Russian sources’ claims that the ‘coordinator’ — that is, the leader — of the neo-fascist Ukrainian ‘Right Sector’ (RS), Dmitro Yarosh, and several other of its members fought in Chechnya against Russian forces in the 1990s. Shortly after the Maidan seizure of power in February 2014, a declaration supposedly issued by Yarosh expressed encouragement to the CE and appealed to its then amir ‘Dokku’ for support of Ukraine’s war with Russia, as Yarosh sees it. With the abovementioned ties, real and hypothesized, and the recent arrest of an at least one-time CE-tied mujahed in Amiraliev in Ukraine, the potential threat of jihadi penetration of Ukraine and through it into Russia and Europe becomes more real. Nezavisimaya gazeta, 23 September 2015, http://www.ng.ru/cis/2015-09-23/7_terrorist.html. See Gordon M. Hahn, U.S.-Russian Relations and the War Against Jihadism, Hart-Matlock Russia Working Group Paper, The Century Foundation, May 2009, http://www.tcf.org/publications/internationalaffairs/hahn.pdf. See also Gordon M. Hahn, “Dagestan Vilaiyat Shura: Amir Khasan Reaffirms Bayat to Umarov, Threatens More Suicide Attacks in Russia, and Announces Leadership and Organizational Changes,” IIPER, No. 31, 17 December 2010, http://csis.org/files/publication/101217_Hahn_IIPER_31.pdf. See Gordon M. Hahn, “Cauacasus Emirate Annual Shura Still Not Convened,” IIPER, No. 18, 6 July 2010, http://csis.org/files/publication/100706_Hahn_IIPER_18.pdf, citing “Znamenie Allakha Vo Vremya Boya v Vilaiyate Dagestan, Golos Amira Khattaba (Shakhid Inshallakh) Prizval Kafirov k Sdache,” Jamaat Shariat, 7 June 2010, 17:43, http://jamaatshariat.com/ru/new/15–/861-2010-06-07-16-44-40.html. “V Azerbaijane pri likvidatsii terroristov iz”yato 20 kg vzryvchatki,” RBC, 30 May 2012, 15:34:37, http://www.rbc.ru/rbcfreenews/20120530153437.shtml; “Spetssluzhba Azerbaidzhana predotvratila terakt nakanune nachala konkursa ‘Evrovidenie’,” Interfax, 30 May 2012, 10:28 http://www.interfax.by/news/world/111788; “Pokushenie na prezidenta i terakty na ‘Evrovidenie’,” Zerkalo.az, 31 May 2012, http://www.zerkalo.az/2012-05-31/short-news/29691-terakt-evrovidenie; and Elman Mamedov, “Eurovision ‘terror plot’ thwarted: Azerbaijan,” AFP, 30 May 2012, http://www.google.com/hostednews/afp/article/ALeqM5g0BB2S9CKtuayJhgOEMhdkzTRTKw?docId=CNG.60490b622cc956adb6a886ff4c892ab7.801. For the names of the some 20 of the detainees taken into custody in the April special operations, see “MNB o podrbnostyakh operatsii protiv religioznykh ekstremistov,” Contact.az, 18 April 2012, 18:28:54, http://www.contact.az/docs/2012/Politics/04184455ru.htm. “V Azerbaijane pri likvidatsii terroristov iz”yato 20 kg vzryvchatki” and “Spetssluzhba Azerbaidzhana predotvratila terakt nakanune nachala konkursa ‘Evrovidenie’”. Daudov was not appointed the DV’s top amir until May 2011; his predecessor was killed in ‘Khasan’ Israpil Velidzhanov having been killed in April. Daudov was killed on February 14, 2012. At the time the noted shura was convened, therefore, Velidzhanov was the DV’s amir, and Daudov was Velidzhanov’s second naib of three as well as the amir of the DV’s Southern Sector bordering Azerbaijan. Thus, the shura may have been a shura of the DV’s Southern Sector not one of the DV as a whole. See IIPER, No. 31, 17 December 2010, http://csis.org/files/publication/101217_Hahn_IIPER_31.pdf, citing “Shura amirov Dagestana. Bayat Amira Dagestana Khasana, 19 October 2010,” JamaatShariat.com, 1 December 2010, http://www.jamaatshariat.com/ru and Kavkaz tsentr, 1 December 2010, http://www.kavkazcenter.com, last accessed 3 December 2010.
www.youtube.com/watch?feature=player_embedded&v=R4T_Nlm8_R0, posted 13 January 2013. See also “Azerbaijan: Ne otstupat’ i ne sdavatsya,” Umma News, 8 April 2012, 17:30, http://ummanews.com/news/last-news/6391-2012-04-07-20-31-35.html. “MNB o podrobnostyakh operatsii protiv religioznykh ekstremistov,” Contact.az, 18 April 2012, 18:28:54, http://www.contact.az/docs/2012/Politics/04184455ru.htm. “MNB o podrbnostyakh operatsii protiv religioznykh ekstremistov”. “Spetssluzhba Azerbaidzhana predotvratila terakt nakanune nachala konkursa ‘Evrovidenie’”. “Pokushenie na prezidenta i terakty na ‘Evrovidenie’”. “Azerbaijan: Ne otstupat’ i ne sdavatsya”. “Vilaiyat Azerbaijan, Imarat Kavkaz,” You Tube, www.youtube.com/watch?feature=player_embedded&v=R4T_Nlm8_R0, posted 13 January 2013. REPORT: Is Putin a Great Strategist?